This is my basic white bread recipe. Made by the folding method it is thoroughly reliable. I always make a double quantity and put one in the freezer. 1. Mix the yeast and water in a large bowl, then add the flour and mix, making sure there is no dry flour left in the bottom of the bowl. 2. Cover the bowl with a clean tea towel and leave for 10 (or up to 30) minutes. 3. Add the salt and “fold” the dough 30 times by using one hand to pull the dough into the centre of the bowl, turning as you go. Turn the dough over to reveal the smooth side, cover and leave to rest for 10 minutes. It may appear sticky but do not be tempted to add more flour. We have a saying from our bread club “wetter is better”! 4. Repeat the folding and resting until the dough has been folded four times. Rest for 30 – 40 minutes. 5. 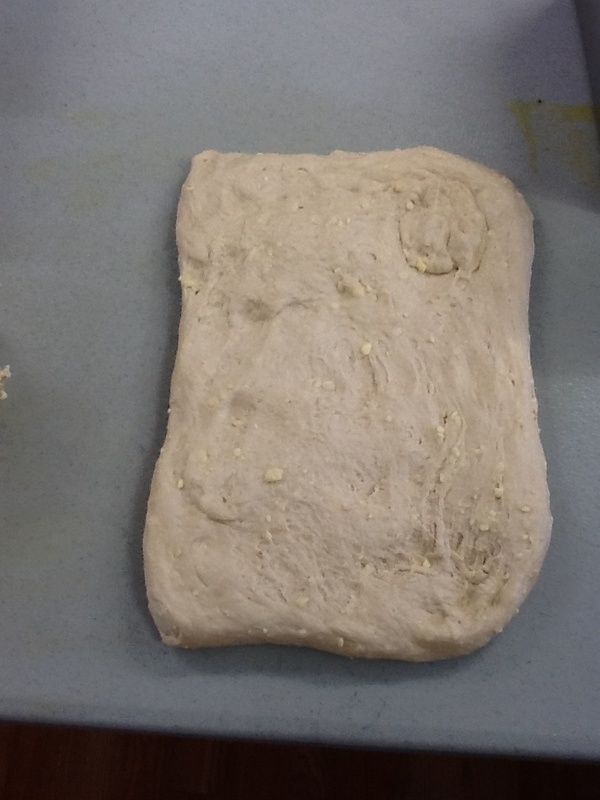 Place the dough on an oiled surface and stretch out into a rectangular shape using knuckles or palms to knock out the air. Fold the top third down over the middle third then bottom third up to make three layers. Turn 90 degrees and repeat. 6. 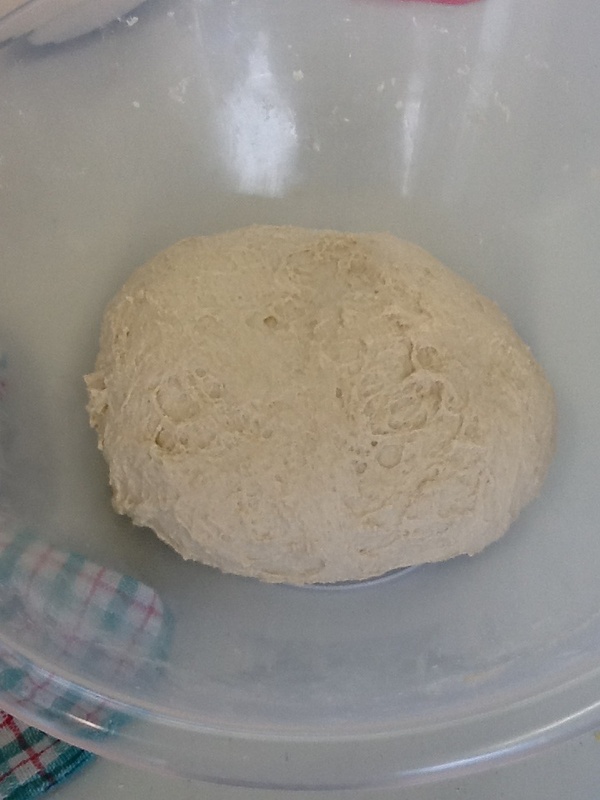 Return the dough to the bowl, cover and rest for 30 – 40 minutes. 7. Turn the dough out onto the oiled surface again. Repeat the stretch and fold but the second time roll the dough into shape (measure the length alongside your oiled loaf tin). 8. Cover with a tea towel and leave in a warm place until the dough has reached the top of the tin (about an hour). 9. 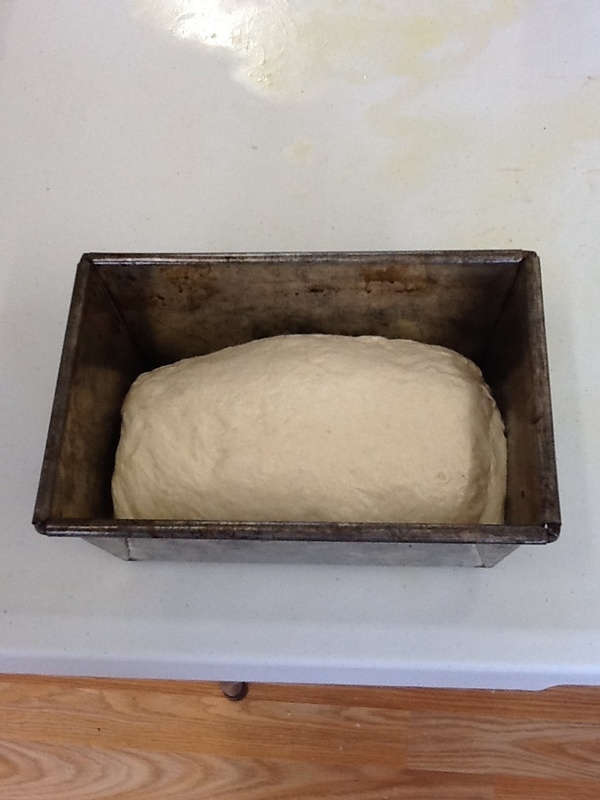 Bake in a preheated oven at 250 degrees c reduced to 200 degrees C when the loaf goes in and bake for 30 -35 minutes. If the loaf is browning too quickly cover with a double layer of foil. 10. Turn out of the tin onto a wire rack to cool. 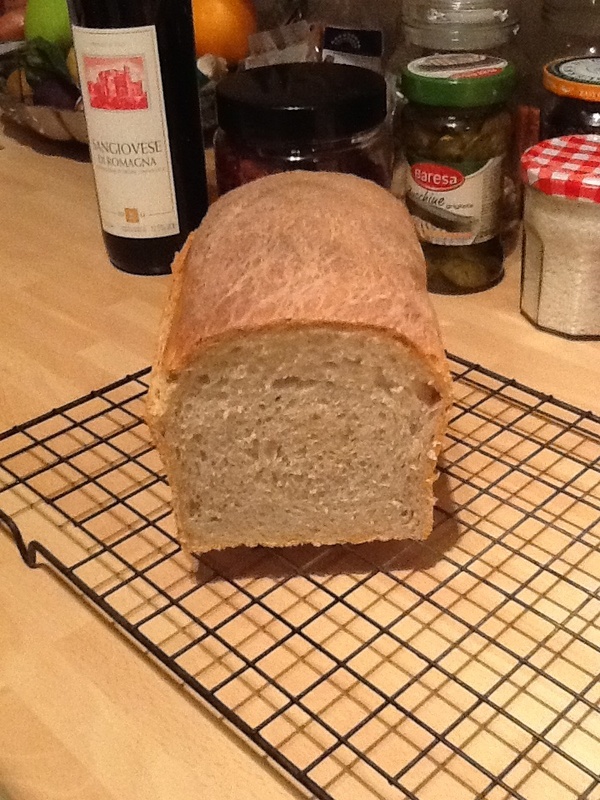 Loaf should sound hollow when tapped on the bottom – you can pop back into oven for 2-3 minutes out of the tin if required.